Pixie Dust Required: Ariana Grande was 3 HOURS LATE at the Disney Christmas taping!! Check out who stole the show! THIS JUST IN!!! 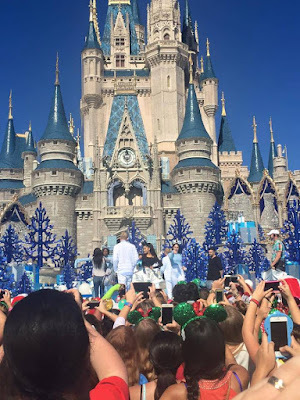 My Friend, Lisa Commander-Thomas (from DisBrides) just informed me that Ariana Grande was scheduled to perform for the taping of the Christmas Parade today at Magic Kingdom. She was running 3 hours late so Disney decided to put some dancers on the stage and some other random fillers. The production was clearly stressed at the 2 hour mark. They had run out of fillers so they started pulling out people from the audience. Some sang, some just posed and had fun. They heard this guy singing in the audience, and threw him on stage. The audience went crazy!!!! Check out this video Kaden Charming got of all the action! His name is Rhett Wheeler and I am hoping to do an interview with him soon!!! Arrianna's crew intentionally blocked the audience's view of her to avoid videos and photos once she FINALLY decided to make her appearance. What a voice!!! Hoping the powers that be in Disney give this man his due TELEVISED!!! TRUE MAGICAL MOMENT! RIGHT?!?! Time will tell! I think they should air him on the taping!!! Ariana Grande is a spoiled brat - surprised Disney had her! She is no role model for kids! !